In 1901 the New York Times (16 May 1901, p. 12) reported the prospective sale of the Wool Exchange Building at West Broadway and Beach Street. The American Thread Company "or interests closely associated with it" was mentioned as the prospective purchaser. The American Thread Company was already a tenant of three floors in the building, which was described as "an eleven-story structure at the northwest corner of West Broadway and Beach Street, 75.5 by 96.3, extending around on St. John's Lane at the rear, where it has a frontage of 141.8 feet. It was put up about 1895, primarily to afford suitable quarters for the Wool Exchange and for the now defunct Tradesmen's National Bank... The banking room is now occupied by the recently organized Varick Bank. The Wool Club has elaborately fitted up rooms on one of the upper floors, and part of the street floor is occupied as a Post Office sub-station." Three years earlier the New York Times (11 March 1898, p. 2) had reported that articles of incorporation of the American Thread Company "with an authorized capital stock of $12,000,000" had been filed with the Secretary of State of the state of New Jersey in Trenton. The incorporators were named as Peter Lowe, Charles N. King, and Ernest F. Charles, all of Jersey City. In a follow up story (4 May 1898, p. 8) the Times quoted Peter Lowe as explaining that the new company had been formed to buy up the stock of a series of thread mills in Massachusetts, Rhode Island, Connecticut, and New Hampshire, including the Willimantic Thread Co. (Willimantic, Conn.), William Clark Thread Co. (Westerly, Rhode Island), Barstow Thread Co. (Providence, Rhode Island), Hadley Co. and Merrick Thread Co. (Holyoke, Mass. ), Kerr Thread Co. (Fall River, Mass. ), and six others. Mr. Lowe went on to explain that an English trust, the English Sewing Company, "will take 60 per cent of the common stock of the American Thread Company, and thus control it. The new combination will manufacture cotton, linen, silk, wool, and other threads." In 1913 the American Thread Company was part of an anti-trust action of the Federal Government, which sought to dissolve the "monopoly by the 'Coats interests' of Great Britain of the thread trade of the United States, including that of the American Thread Company, itself a consolidation of fourteen American companies" (New York Times, 4 March 1913, p. 1). (The 'Coats interests' refers to J. & P. Coats, Ltd. of Great Britain.) The suit sought to dissolve the Thread Trust which essentially consisted of American Thread and J. & P. Coats, Ltd. In June 1914 Federal Court in Trenton decreed that they were in violation of anti-trust statutes and ordered a dissolution of these interests. The American Thread Company continued to function after they were split off from their British partners, and most of the news stories for the next twenty years consisted of various strike actions at their mills, particularly those in Willimantic, Conn., and Fall River, Mass. The American Thread Company maintained offices and a storage and distribution center in the building at 260 West Broadway until the mid-1960s. The New York Times, 21 Aug. 1964, pg. 41, reported on their move to 90 Park Avenue as follows, "The American Thread Company has leased a floor in the new office building at 90 Park Avenue and will move its executive offices in December from quarters it has occupied at 260 West Broadway since the company was founded in 1898. 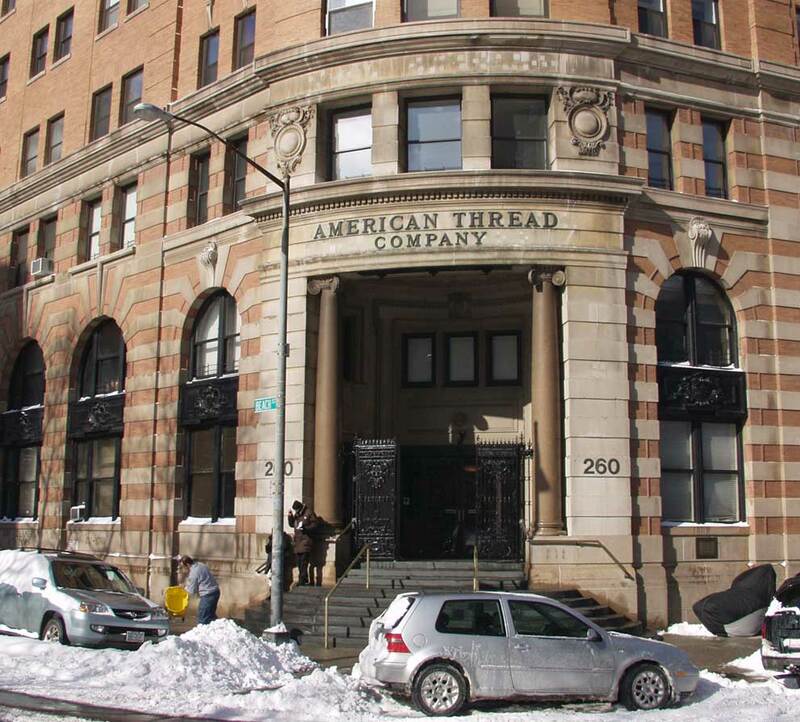 American Thread, which manufactures thread and yarn, bought the 11-story building on West Broadway, at the corner of Beach Street and the Avenue of the Americas, when it was founded. The building had been erected in 1893. ... American Thread, which operates six plants and has a seventh under construction, will keep its branch office, warehousing, distribution and shipping departments at 260 West Broadway, where it occupies three floors under lease. The company sold the building two years ago..." In 2005 the National Register of Historic Places added 260 West Broadway to its list. Seemingly hundreds of people served in executive positions with American Thread over the years. Many of them were the founders of companies absorbed by American Thread. This ad from 1892 for the Clark Thread Co. in Westerly, Rhode Island, mentions three of the Clark family who were associated with American Thread. When Robert K. Clark (1860-1932) died in 1932, he was credited with founding the mill in Westerly: "Robert K. Clark, a founder of the Clark Thread Company of Westerly, R. I., and a director of the American Thread Company, died this afternoon... Born seventy-two years ago in Paisley, Scotland, where his father, William Clark, was a member of the Merr & Clark Thread Company, Mr. Clark was a graduate of Princeton. He founded the mill in Rhode Island after leaving college. The concern was purchased by the American Thread Company in 1889 and Mr. Clark was appointed agent of the Holyoke Mills, of which there were then three" (New York Times, 21 Dec. 1932, p. 19). Theodore Milton Ives (1844-1909) was another early member of the firm. His death notice in the New York Times (13 July 1909, p. 7) reads in part, "Theodore Milton Ives, Secretary and Treasurer of the American Thread Company, 260 West Broadway, died yesterday in his home, 43 Fifth Avenue, in his 65th year. Mr. Ives had been connected with the company in this position since its foundation about ten years ago. For some years previous he was connected with the Willimantic Linen Company." Ives is one of the directors of the Willimantic Company (Connecticut) in this ad from Geer's Hartford City Directory of 1896. Alexander King (1839-1913), like Robert K. Clark, was born in Paisley, Scotland. Alexander King died from injuries suffered when he was run into by automobiles (twice, one in August, and again in December, 1913). His obituary in the New York Times (6 Dec. 1913, p. 2), states, "Shock resulting from injuries sustained on Wednesday night when he was struck by an automobile near his home caused the death at noon to-day of Alexander King, 73 years old, one of the organizers of the American Thread Company, of which he had been First Vice President for a number of years... Born in Scotland ... Mr King was a son of a cotton thread weaver and merchant. When he settled in New York he founded the cotton thread concern known as Alexander King & Co., with factories in New York and Providence."